With the recent series of posts on paintbrushes, I've not only been educated, I've finally got a real brush I can use to paint with. 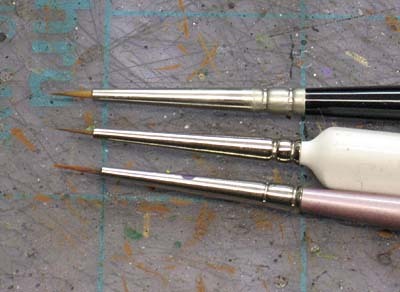 A little while ago, I posted a great series of posts on paintbrushes done by misterjustin of Secret Weapon Miniatures. Since then, I went out a bought myself a "better" paintbrush in the respect that it has a bigger reservoir. I tried using it once, but quickly slipped back into old habits in order to keep up my pace of painting. Along comes John from Santa Cruz Warhammer who emails me and then turns around and sends me a "real" paintbrush to use. He also sent me some killer looking dice, but that's another story... this is about paintbrushes. I'm almost afraid to use the brush, it looks so "professional." But, what kind of person would I be if I didn't take someone else's model and do some experimenting with my new "fancy" paintbrush? I've got just the model I can try it on to see how how it holds up compared to what everyone is telling me. I'll be posting my results this coming week as part of a new project I'll be working on. I have to say, I'm a little hesitant to try it, but I'm going to put aside all my preconceived notions and give it a good run through to see how it holds up. NEXT: A 5 month review of my "good" brush. I know the feeling, but don't think of it as saving it for the right moment, it's not that big of a deal. You are not going to use it up. Its just a tool, its like upgrading from Craftsman to Snap On. Dial up to high speed DSL. CRT 17 inch to big flat screen HD. FTW 40k Bloggers Group 2 to 1. It's going to make all you wildest dreams come true. I'm not going to lie... it's been a nice change using a "professional" brush. Seriously though... thank you John. Winsor and Newton series 7 brushes are incredibly good. I got a 000 and 00 a couple of years back and my painting has improved leaps and bounds since. It makes such a difference not having to worry about fly-away bristles or how sharp/fine a point you can get with the brush when painting. Looking forward to your own results. After the articles I went out to buy some supplies. I ended up with a magic mix for thinning and no brushes since they didn't have neither Raphael nor Windsow and newton series 7! I have used the thinning solution with my current brush and it really helped. So I urge everyone to try thinning their paint with something else than just water. It flows differently and dare I say, better. So I have ordered some Raphael on the net (together with some bases:)) so it will be interesting to combine better thinning and better brushes. Ron how do you thin your paints? Tried different things? Flekkzo: I have another "fancy" brush on order. Looks like I'm upgrading all around these days. I've been using my new brush today and I have to say I'm impressed so far. As for thinning, I only do it about 50 percent of the time and even then, it's just water that I use. Now if I start using oils, I'll be getting into other things. I loved oils in art school and I'm looking at bringing them back for some experimenting here at some point. When I bought my series 7 brushes it took me about 6 weeks to actually use them. I was scared to death that the chunk of cash I had just dropped as going to go down the drain. That was 5 or 6 years ago and they are still going strong. It is worth the $ and you WILL fall in love with them. I felt the same when I got my first Series 7 brush, I almost didn't want to use it at first. I used to say to myself "I will just use it on the important bits"
Now, I am used to them and never use anything else with the exception of my GW drybrush! Drunken Samurai: I keep looking at it for the same signs of deterioration that my other brushes show so quickly so that I can say "I told you so, there's no need for fancy brushes!" but it seems to be holding up just fine. IDICBeer: I still use other brushes for things like washes and such, but when it comes to the detail painting, it's seeing the lion share of the work.